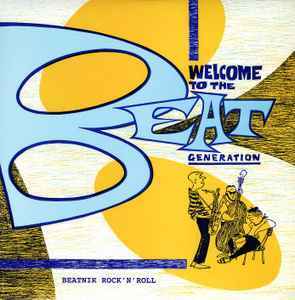 Unofficial reissue of <a href="http://www.discogs.com/Various-Beat-Beat-Beatsville-Beatnik-Rock-N-Roll/release/2625180">this compilation</a>, with the artwork of <a href="http://www.discogs.com/Various-Welcome-To-The-Beat-Generation/release/2741280">this compilation</a>. On the front cover it says: "Welcome To The Beat Generation - Beatnik Rock 'N' Roll", while on the spine it says: "Beat, Beat Beatsville - Beatnik Rock 'N' Roll". There is no official info on the record whatsoever. According to Allmusic it was released on Beatnik Records (supposedly Spanish) in 2011. But at the moment this info cannot be confirmed. Track B8 might be incorrectly credited to Johnny Beeman and actually be performed by Richard Pine. Diese Veröffentlichung wurde für den Verkauf auf Discogs gesperrt. Es ist nicht erlaubt, diesen Artikel auf Discogs zu verkaufen.